Indigo is one of the oldest cultivated plants, used for centuries and longer to make a beautiful blue dye. Whether you are growing indigo in your garden to make the dye or just to enjoy the pretty pink flowers and shrub growth habit, indigo irrigation requirements are important to understand to help it thrive. 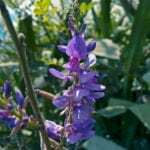 There are false indigo plants, but true indigo is Indigofera tinctoria. It grows best and as a perennial in zones 9 and up; in colder areas you can grow it as an annual. Indigo is a small or medium shrub, growing to about five feet (1.5 m.) tall. You can trim it to shape into a pretty flowering shrub that produces pinkish purple blooms. The dye comes from the leaves. Indigo plant watering is important to consider, not just for the shrub to grow well and thrive, but also for dye production. Make sure your plant gets enough water and at the right frequency for it to be healthy but pay particular attention to water if you are going to be the harvesting leaves for dye. If you are not harvesting leaves to make dye, watering needs for indigo are pretty simple. In fact, when you have a well-established plant, it will be pretty tough in the face of drought. Begin by watering every couple of days in the growing season to get your shrub established. The ideal conditions for the soil are evenly moist, so don’t let it dry out too much. And, be sure the soil drains well. You can water less in the winter. Watering indigo plants becomes more important if you are making dye. Studies have shown that the frequency of watering can impact how much dye you get from an indigo plant. For instance, yields of dye were higher when indigo bushes were watered every one week as compared to irrigating every two weeks. Yield was also found to be higher when watering stopped one week before harvesting the leaves as compared to ten days or longer. If you are growing indigo to enjoy a pretty shrub, water regularly in the growing season until it is established and after that only when it hasn’t rained a lot. For harvesting dye, even when established, continue to water your indigo at least once a week.